LABELLE, François-Xavier-Antoine (baptized Antoine), Roman Catholic priest, promoter of colonization, author, and civil servant; b. 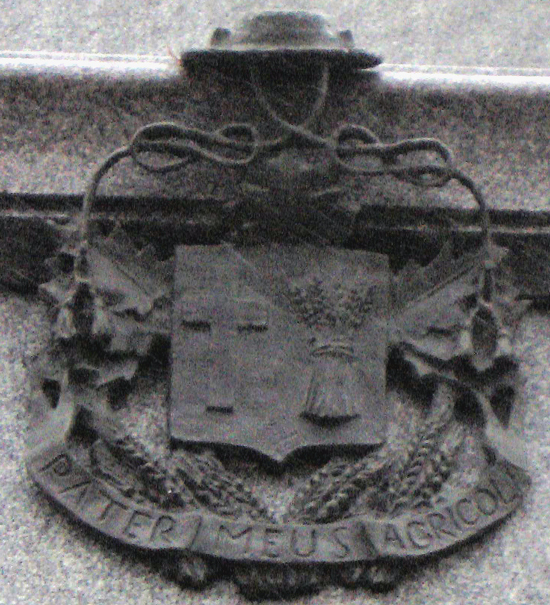 24 Nov. 1833 in Sainte-Rose (Laval), Lower Canada, son of Antoine Labelle, a shoemaker, and Angélique Maher; d. 4 Jan. 1891 at Québec and was buried four days later in Saint-Jérôme, Que. The parents of Antoine Labelle, whose marriage had been without issue, attributed his birth to the intercession of St Francis Xavier, as he himself did, and at some undetermined date he added the saint’s name to his own. The first 35 years of his life were spent in relative obscurity. After a childhood about which almost nothing is known, he entered the Petit Séminaire de Sainte-Thérèse in 1844, probably under the patronage of his parish priest, and took classical studies until 1852. He is said to have been especially interested in history and philosophy. He read works by Joseph de Maistre, Jaime Luciano Balmes, and Louis-Gabriel-Ambroise, Vicomte de Bonald, but was particularly enthralled by those of French apologist Auguste Nicolas, learning them virtually by heart. The reasons for this youthful enthusiasm are somewhat unclear. But it is known that Nicolas was trying to demonstrate that the most recent scientific advances accorded with the tenets of Christian dogma; Labelle himself always looked to the future, fascinated by the idea of progress and the possibilities presented by scientific and technical developments. For him such advances were in no way incompatible with the enduring values of religious and cultural tradition. Labelle’s specific training for the priesthood was brief. While performing various duties at the Petit Séminaire de Sainte-Thérèse, he studied theology from 1852 to 1855. 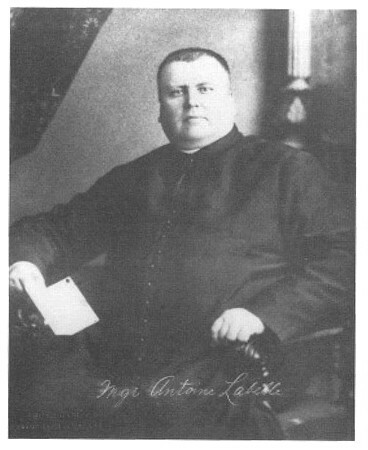 After a final year at the Grand Séminaire de Montréal he was ordained a priest in Sainte-Rose on 1 June 1856, before he had reached the required canonical age. Having served three and a half years as curate at Sault-au-Recollet (Montréal-Nord) and at Saint-Jacques-le-Mineur, he was appointed parish priest by Bishop Ignace Bourget, first at Saint-Antoine-Abbé from 1859 to 1863, and then at Saint-Bernard-de-Lacolle from 1863 to 1868. In these two quite poor parishes close to the United States border, which were marginal communities still in an early stage of development, the young priest had to face both bitter dissension among his fellow Catholics and a strong Protestant presence. Although already demonstrating leadership by overcoming these obstacles, he nevertheless often fell prey to discouragement. Once he secretly admitted to his bishop that he almost regretted having become a priest, and on another occasion he expressed a desire to withdraw to a monastery. He was plagued with financial problems and had to go into debt. Under this intolerable burden, the man who would later justifiably be considered one of the most ardent champions of the struggle against French Canadian emigration to the United States, in the depths of despair felt he had to ask his bishop on 12 Nov. 1867 to let him go to an American diocese where he would receive a better salary, and thus be able to pay off his debts and give his mother a pension. Rather than grant this request, Bourget on 15 May 1868 appointed him priest of the prosperous parish of Saint-Jérôme, a charge he was to hold until his death. As the head of the most populous and hence most politically important parish in Terrebonne County, Labelle soon began actively campaigning for the Conservative party, which was then in power both provincially and federally, and for its member in the Québec legislature, Joseph-Adolphe Chapleau. His influence was exercised with skill and restraint, which probably made it all the more effective. Moreover, his support was especially valuable to the party, since from the ranks of the clergy itself he opposed the ultramontanes, who upon the publication of the Programme catholique in 1871 [see François-Xavier-Anselme Trudel] publicly rebelled and threatened the hegemony of the “great national party.” In return for his services, Labelle was particularly well placed to seek and obtain government favours, such as grants for building roads in remote parts of the region. His political connections also helped him act as unofficial negotiator between church and state in the drafting of several bills which concerned both. However, it must be remembered that Labelle did not earn his place in history through these political activities, or even through his specific priestly and pastoral responsibilities, but as the apostle of colonization and king of the north. However, in Labelle’s view, this reconquest would only be complete if it were at the same time an economic one. He expected the prosperity of this kingdom of the north to come from the exploitation of its agricultural and mining resources, from factories in its future cities, from the business and tourism that would develop, and from the network of railways that would criss-cross the region. His plan for settlement was no mere expression of a vague belief in the virtues of agriculture. He advocated the agricultural development of the Ottawa valley, relying on reports by experts that indicated there were large stretches of fertile land. But he was also convinced that “there are abundant mineral resources in the Laurentians, [and] that gold, silver, and copper are as plentiful there as in California, in Nevada, or on the Colorado,” and he urged that they be exploited. He encouraged his own parish to move toward urbanization and industrialization, and in 1881, for example, he had a hand in bringing Jean-Baptiste Rolland’s large paper-mill to Saint-Jérôme. However, taking the American model as his inspiration, he counted mainly on railway building to develop the new territories. Thus when the Montreal Northern Colonization Railway was formed, just a few months after his arrival in Saint-Jérôme, he immediately took an interest in the completion of the project. In 1873 Sir Hugh Allan, its president, and John Joseph Caldwell Abbott, Allan’s lawyer, paid tribute to his efforts, and when the Montreal to Saint-Jérôme portion of the western section of the Quebec, Montreal, Ottawa and Occidental Railway was officially inaugurated on 9 Oct. 1876, it is significant that one of the first two locomotives in service was named “Rév. A. Labelle.” Labelle later called persistently for the expansion of this line and the addition of more branches. Labelle did more than just make speeches. He explored the wilderness himself on foot and by canoe. By 1887 he had made 45 such trips, some lasting three or four weeks. In this way he gradually determined the sites of future population centres and over the years helped to establish some 29 townships, creating about 20 new parishes. After urging the government to start surveying the land and constructing roads, he directed an estimated 5,000 settlers to these localities. In connection with such activities, around 1879 Labelle gained the support of Arthur Buies, a prolific writer who became his official publicist and first collaborator. With the growth of the colonization movement, which was linked to the severe recession of 1874–79, Labelle began to seek financial support. Thus in 1879 he founded the Société de Colonisation du Diocèse de Montréal and in 1884 he started the Loterie Nationale de Colonisation. Neither of these initiatives lived up to his expectations. On an official mission for the Canadian government from February to August 1885 he travelled across Europe with the goal of attracting French-speaking immigrants and investment to Canada. Since at least 1879 he had been advocating the elevation of the diocese of Ottawa into an archdiocese, in order “always to have a French hierarchy in this province.” He now wanted to consolidate the francophone character of church leadership and prevent the Irish from holding this strategic see. Hence he began campaigning in 1887 for the establishment of a new diocese in Saint-Jérôme, with a bishop who would be a suffragan of the diocese of Ottawa. On 16 May 1888 the Liberal premier of Québec, Honoré Mercier, doubtless partly to make up for having committed the political blunder of publicly questioning the honesty of the apostle of colonization, appointed him assistant commissioner in the Department of Agriculture and Colonization which had just been set up by his government. Taking up his duties, Labelle first of all set to work, with the new commissioner of crown lands, Georges Duhamel, to reform the legislation governing timber limits. The chief effect of the new law, which was enacted on 12 July 1888, was to abolish forest reserves and remove the permanent restrictions on pine wood. Labelle also won renown for securing passage of the famous “100 acres bill,” which stipulated that every family with 12 living children could obtain a grant of 100 acres of crown land without charge. Labelle’s last years were none the less turbulent. The Conservatives saw him as a turncoat and opposed him at every turn. Priests. and laymen alike put pressure on his archbishop, Édouard-Charles Fabre, to make him resign and send him back to his parish. Fabre did not take this step until, against his express wish, Mercier obtained directly from Rome on 3 July 1889 the title of protonotary apostolic ad instar for his assistant commissioner. Despite a unanimous request to Fabre from the cabinet, Labelle was not allowed to retain his governmental office. Pressed by Mercier, Pope Leo XIII had to intervene twice with the archbishop, in November 1889 and then in May 1890. In the mean time Labelle made a second trip to Europe at the request of the provincial government, from 9 January to 15 Sept. 1890, again with the official purpose of promoting French immigration, but also to undertake in Rome the defence of both his reputation and his proposal for a new diocese against his archbishop, whom he accused of obstructing “the upward movement of Catholicism.” Fabre finally won; on 23 December a letter came from Rome that spelled the failure of Labelle’s project. This defeat, the culmination of many other set-backs, was a crushing blow, for it undermined the religious base on which his dream rested. He saw himself as “the victim who was covered with flowers, to make a more perfect sacrifice.” His hopes defeated, he felt condemned to spiritual death. Labelle resigned as assistant commissioner on 26 Dec. 1890. If the Montreal Star reporter who interviewed him that day is to be believed. he wanted to quit his parish then and there, retire to the land he had colonized, where he would live quietly until the death of his mother, and then sell his possessions to end his days in Rome. In the face of the reality that his kingdom could never be built, the last dream of the patriot priest was to leave his country for good. His resignation was rejected by Mercier on 27 December, and after a brief illness Labelle died at Québec in the early hours of 4 Jan. 1891. The curé Labelle was certainly one of the most popular and legendary figures in Québec during the second half of the 19th century. There were numerous reasons why he amazed and fascinated his contemporaries: his colossal stature, the freedom of expression he owed to his humble origin, his spirited temperament, his fiery harangues both in private and in public, his close contacts with important figures and his affinity for ordinary people, his utter dedication to the cause of colonization, as well as his proverbial generosity and, perhaps above all, his grandiose dreams and visions of the future which made him seem a madman to some but a sage and the saviour of his country to others. On a deeper level, he incarnated a fundamental dimension of the culture of his society. François-Xavier-Antoine Labelle had been born in the heart of a region stirred to rebellion by the Patriotes in 1837–38 and brought up in the climate of religious renewal of the 1840s, when Roman Catholicism was more and more firmly established as the national religion. He embraced wholeheartedly the messianic religious nationalism which, after the failure of the rebellion and the report of Lord Durham [Lambton], replaced the violent, and henceforth impossible, political nationalism of the preceding decades and gradually became the chief instrument of resistance and struggle. Labelle was both hero and victim of this religion, with its dreams and expectations of liberation and collective salvation. To it he owed both life and death. Société de colonisation du diocèse de Montréal (Montréal, 1879). Pamphlet sur la colonisation dans la vallée d’Ottawa, au nord de Montréal, et règlements et avantages de la Société de colonisation du diocèse de Montréal (Montréal, 1880). É.-J.[-A.] Auclair, "le Curé Labelle, sa vie et son œuvre; ce qu’il était devant ses contemporains, ce qu’il est devant la postérité", (Montréal,1930). Hélène Tassé, "le Curé Labelle et la Région Labelle (1879–1891)", thèse de m.a., (Univ. d’Ottawa, 1968). Robert Lévesque et Robert Migner, "le Curé Labelle: le colonisateur, le politicien, la légende ", (Montréal, 1979). 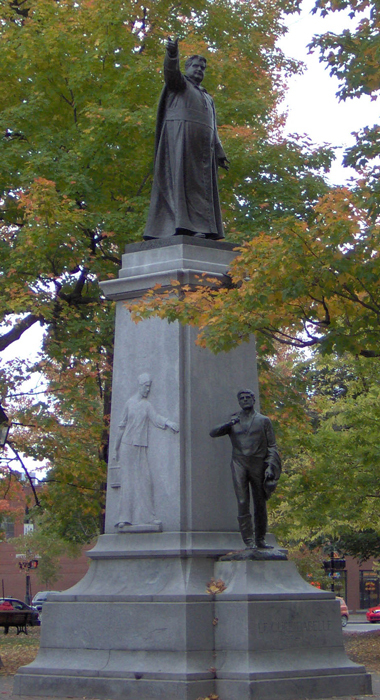 Gabriel Dussault, "le Curé Labelle; messianisme, utopie et colonisation au Québec, 1850–1900", (Montréal, 1983). 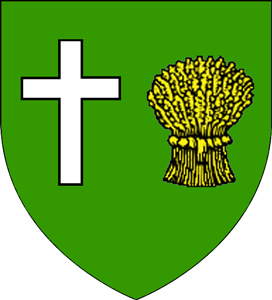 "De sinople à une croix alésée d'argent senestré d'une gerbe d'or"
Notes: The crest can also be topped with an ecclesiastic official hat that symbolize the "Protonotaire apostolique" function that held Antoine Labelle. The moto glorifies the memory of his father who was a farmer. Warning: I can certify the general drawing of the crest, but i could not find the exact colors of each pieces. The colors has been choosen accordingly with the hieraldic rules and common usages. See picture of the dedicated monument in St-Jérôme where we can see the details of the crest. 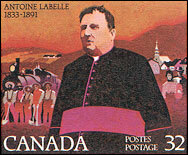 On Septembre 16, 1983, the Philatelic Service of Canada Post issued this commemorative stamp of Mgr. Antoine Labelle. Québec illustrator Jacques Hamel has rendered the portrait of Curé Labelle flanked by representations of his beloved colonists, their cleared land, and the "petit train du Nord". 623 - "Dictionnaire Biographique du Canada en ligne", Archives Nationales du Canada (ANC), ANC et Bibliothèque nationale du Canada, 24 oct. 2004, Site Web et imprimés, www.biographi.ca/fr/index.html, (19 Mar 2004), Web (Site Web) , <3>.